Setting in Stone Nablus and Boulder as Sisters! 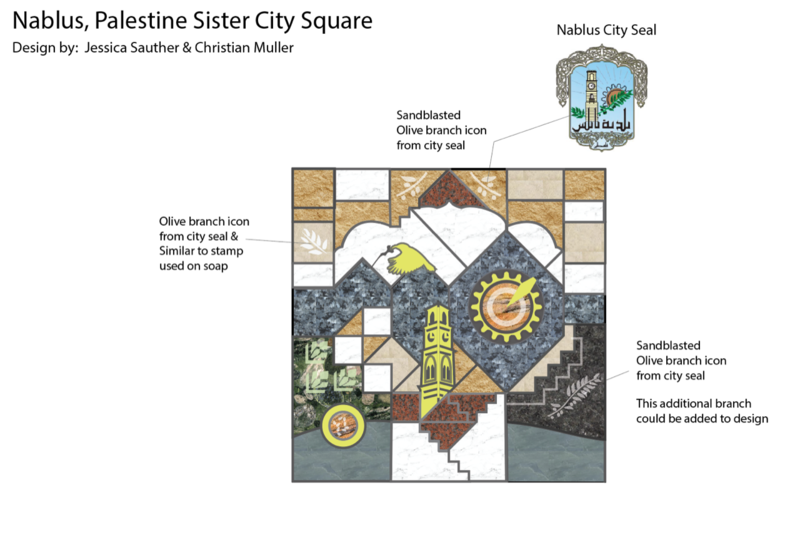 A tile to honor Nablus, Palestine in Sister City Plaza at Boulder’s Municipal Building! Boulder artisans have been hard at work designing and constructing a gorgeous tile to set in stone the relationship that has been established between Boulder and Nablus, Palestine. The lovely Nablus tile has been crafted by the artists who created the other 7 tiles in sister city plaza in front of the municipal building. Colleagues from the Municipality of Nablus helped to create this design from elements significant to Nabulsi culture, including; the Palestinian Sunbird, Instruments used in Soap-cutting, (Nablus has been producing soap from the same factories for 800 years), Palestinian embroidery, the Clock Tower, the Samaritan Holy site of Mt. Gerizim, and its pair Mt. Ebal, which together cradle the city of Nablus, Kunafeh, the delectable dessert that originated in Nablus and the Nablus City Seal. We invite you to celebrate this moment to honor the relationship and to recognize the gifts that Nablus contributes to the Boulder community.